Many users face certain problems when want to record a video guide or manual for a certain product, videogame session or Skype video chat, or some other on-screen activities. In this case, Icecream Screen Recorder would be a great solution. This application not only helps you capture video but also offers a number of useful tools for advanced screen recording. 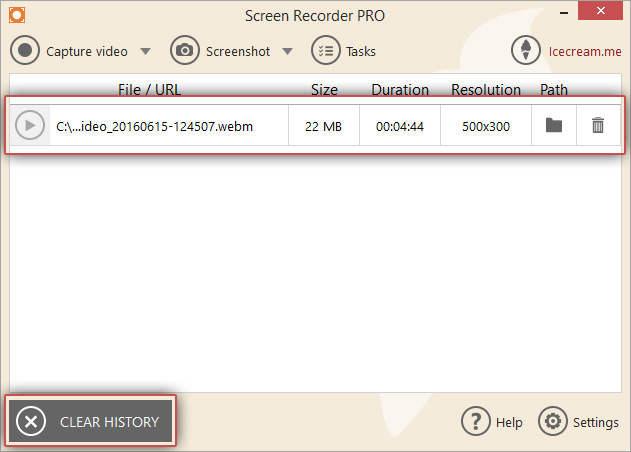 Read on to understand how to capture video with Icecream Screen Recorder. 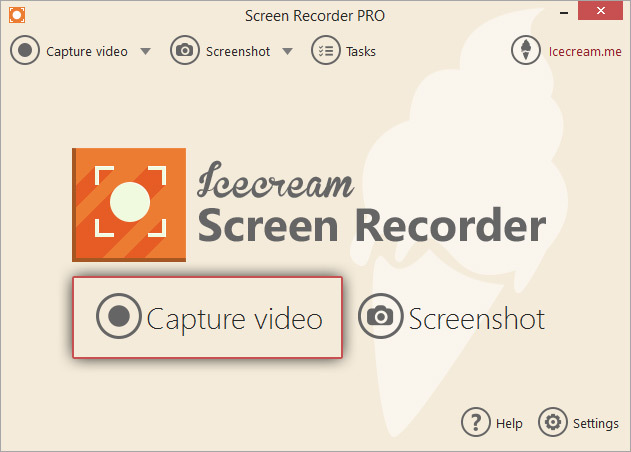 Users can download Icecream Screen Recorder from the official website of the program. Save the setup.exe file on the hard drive. After that, open the saved file and complete the installation as suggested by the Wizard. Upon the completion, it’s possible to start using the program right away. System. 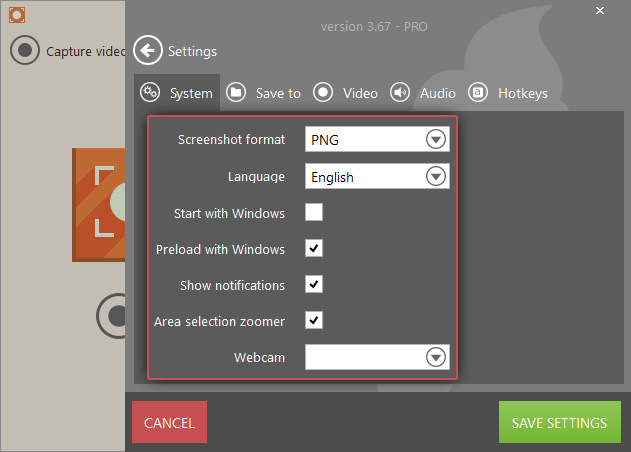 In the “System” tab of the Settings panel of this screen capture software you can select the language of the interface of the software (over 45 languages are available to chose from), select if you wish to see the notifications given by the program (“Show notifications” option), if you wish the area selection zoomer to be shown for the more effective recording area selection (“Area selection zoomer” option) and pick the right webcamera device from the drop-down list of all such devices available (“Webcam” option). Save to. 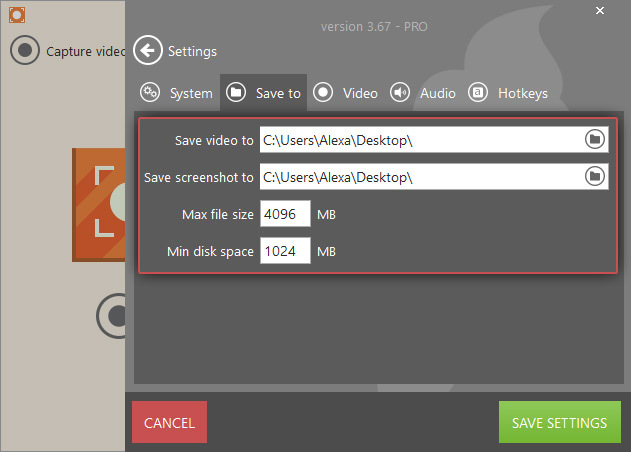 In this section, user can specify the output folder for videos. After that, all the videos captured with Icecream Screen Recorder will be saved in this folder. Also, type in the necessary values for the “Max file size” and “Min disk space” settings. 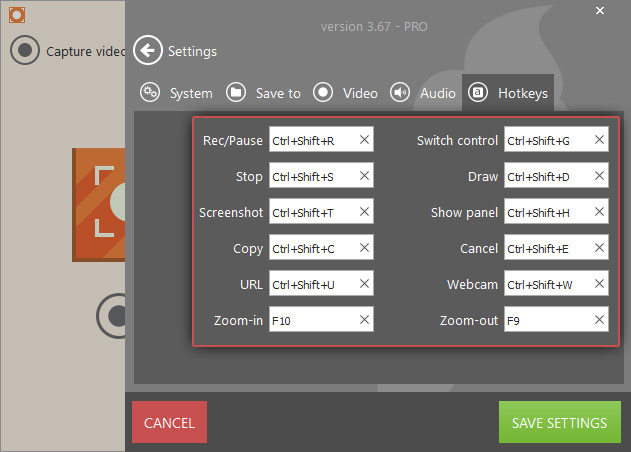 These settings are quite important if you are going to record long videos by means of the program. Make sure you have sufficient disk space. Video. Select the required video format (WebM, MP4, AVI or MOV) and the video quality (High, Medium, Low) for the created videos. 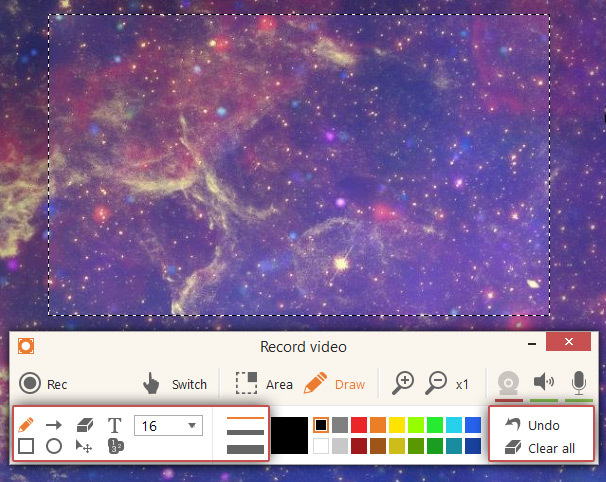 Also, decide if you wish to record mouse (“Record mouse movements”), highlight the mouse cursor when clicking (“Highlight mouse”), hide all the icons from your desktop (“Hide desktop icons”), turn off the screensaver (“Disable screensaver”), see the countdown before the video recording starts (“Show countdown”) and record the hotkey combinations that would be used during the video capture (“Record hotkeys used”). To add a custom watermark to your recorded videos select the “Watermark” option. Upload an image to be used as a watermark, select it location in the video (Top Left, Top Right, Bottom Left, Bottom Right or Center) and its opacity (“Watermark opacity” option). Audio. 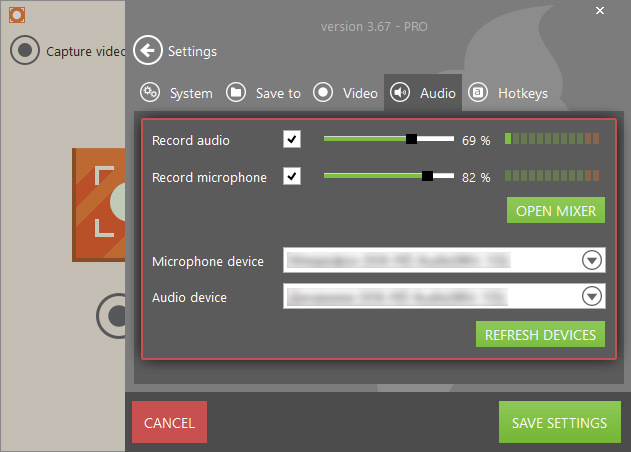 To record the audio with the video, mark the “Record audio” option. To be able to add the comments to the video through the microphone, select the “Record microphone” option. Use the scrollbars to the right of these settings to customize their volume levels. To tweak sound configurations, click on the “Open mixer” button. The program will show 2 panels for general sound and mic – play with the settings to set the desired volume and other characteristics. To select the correct audio and mic devices to record audio and microphone from, pay attention to the “Microphone device” and “Audio device” settings. Choose the correct audio and mic devices from the drop-down lists. If a device was just plugged or the program doesn't offer it, hit the “REFRESH DEVICES” button to scan for all the audio and mic devices currently available on your PC. Hotkeys. Hotkeys like “Rec/Pause”, “Stop”, “Switch control” and “Cancel” will be useful while capturing video. User can set custom hotkeys or use the default ones in this section. Press “SAVE SETTINGS” button to apply the chosen settings or “CANCEL” to cancel them and go back to the main window. To capture video, press the “Capture video” button in the middle of the main window. Toggle the frame over the desired area and release it once it’s selected. Then, specify the desired parameters: custom, full screen, 960p, 720p, 1024x768p, 640x480p, 320x240p, or 160x140p. 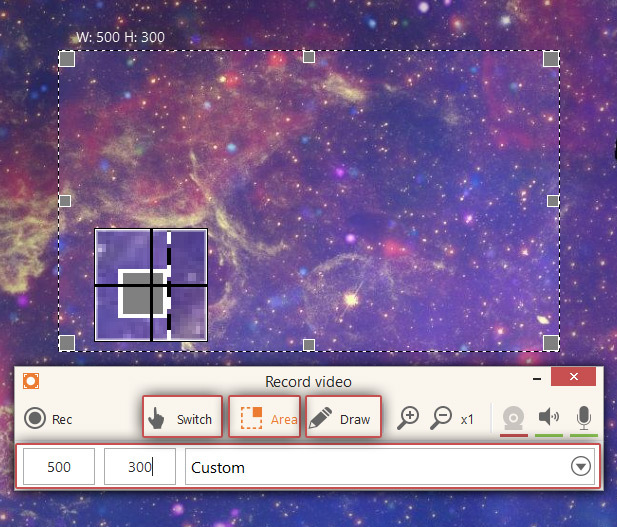 Use the “Switch” button to activate the desktop because all the buttons and panels will become unclickable after selecting the area for recording. However, in case you’ve decided to hide desktop icons in the Settings panel, you wouldn’t be able to use the icons on your desktop. The “Draw” button opens a draw panel with different drawing instruments like a brush tool (it’s possible to choose brush color and thickness as well just like in the standard image editors) or geometric tools like oval, rectangle, and arrow. Step tool is also available on this panel. All these tools will help to make the video more intensive, especially when the user captures video with no sound. Besides, it’s possible to use the text tool (“T” icon on the control panel) to type over the screen. You can control the font size and color just as you do in regular text editors like MS Word. To start typing on the screen, single click on the selected area. If the user accidentally applied a wrong effect, the “Undo” button at the right side of the window will help cancel the recent changes. Use the “Clear all” button to delete all the applied effects and go back to the initial state of the screen. 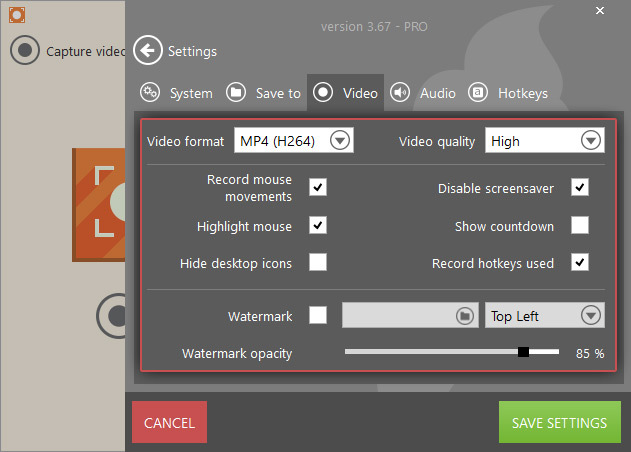 The “Record” icon is located in the center of the main window – click it to start recording. The process will be initiated immediately. In case you’ve checked the “Show countdown before recording” box in the Settings panel, the recording will begin after the countdown (from 3 to 1). Users can utilize the controls described earlier to manage the process right during the recording. Thus, it’s possible to draw or type on the screen while the record’s on. Use the “Pause” icon to temporary stop the process, add some graphical elements or switch between the windows, and press “Resume” to continue to capture video from where it was stopped. You can use zoom in (up to 16x) and zoom out during the video capture (magnifying glass icons with “+” and “-” symbols accordingly). 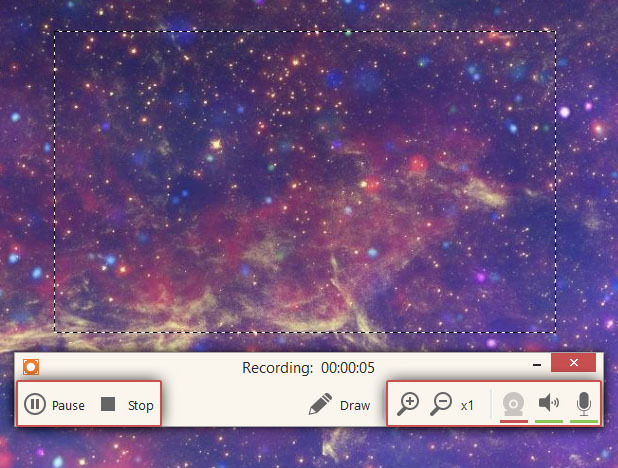 Click the webcam icon to add a webcamera window to your recording. Audio and mic volume levels can be customized or disabled by licking the audio icon and mic icon in the right hand side of the control panel of this screen capture tool. Pressing the “Stop” icon will finish the process. You know the video is created when you see a popup notification in the bottom right corner of the screen (unless you disabled the notification in the Settings panel of the program). Clicking the folder icon in this popup window will bring you to the containing folder; alternatively, close the control panel and open the video with a default player by double clicking on it. All the videos will be displayed as a chart in the main window. To clear the history of created projects, press the “CLEAR HISTORY” button on the bottom left. To delete a single video from the list, hit the recycle bin icon to the right of the file.